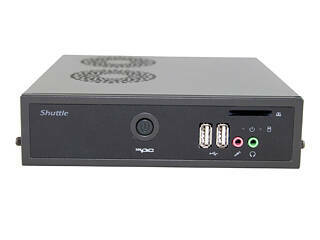 Shuttle needs no further introduction when it comes to mini- and slim-PC systems, so we will cut to the chase immediately. In this review, we will take a rigorous look at their DS61 offering. 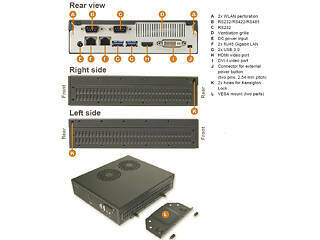 It is basically a slim, barebone PC for the digital signage market. The word "barebone", for those of you that don’t know, denotes that you will have to equip it with some components—usually CPU, RAM, and an SSD/HDD—in order to make it fully operational. Barebones allow for more customization, which gives users the ability to pick the crucial parts they need to meet their ends—all based on their budget. Our sample is the V1.0 DS61. There is also a V1.1 with two additional USB 2.0 ports at the front. The chipset used is the Intel H61, but the mainboard also features an LGA1155 socket, so it supports Sandy Bridge or Ivy Bridge CPUs with up to 65 W TDP. There is no room for a discrete VGA, so the embedded GPU of the CPU will be used. Finally, the two SO-DIMM slots can take up to 16 GB of RAM in total and are officially rated for up to 1333 MHz speed. The networking section includes two Gigabit Ethernet ports that support the Wake-On-LAN function. Both can also be teamed up. The audio is handled by a Realtek ALC662 IC, but internal storage only supports the older SATA II protocol, so there is absolutely no point in installing a new SSD with SATA III capability. 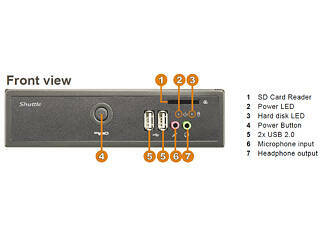 As you can see, the DS61 features many I/O ports, including the basic audio ones, two USB 2.0- and two USB 3.0 ports (at the rear), two RS-232 ports that will be of use to some users since a variety of peripheral devices still use serial communication, a DVI-I dual display along with an HDMI output, and, finally, a useful SD-card reader. The unit is supplied with power through an external power brick because its compact dimensions don't allow for an internal PSU (Power Supply Unit). The brick can output up to 90 W of power, which is enough to easily cope with the needs of the DS61. The system has an empty internal Mini-PCIE socket with m-SATA support should the single 2.5" drive not be enough to cover your needs. The most crucial feature of the DS61 is probably its really compact footprint that will make it suit situations where space is a commodity. Its bundled VESA mount is the cherry on top because it allows you to install/hide the unit behind a monitor. Finally, the price looks decent considering the features it has, but the warranty is very short. We expected at least two years, especially since Shuttle states that the polymer caps they used will significantly prolong the unit's lifespan.